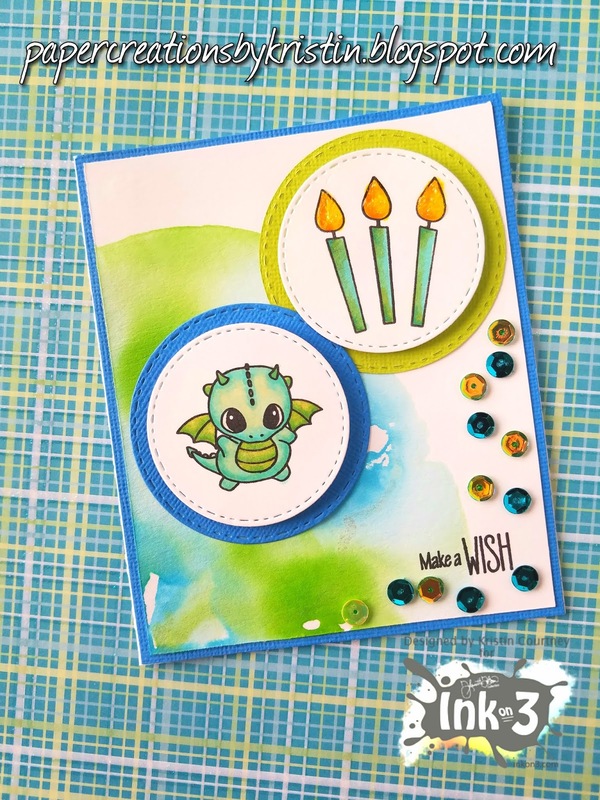 Sharing a card today made with the Magic Dragons stamp set from Ink On 3. 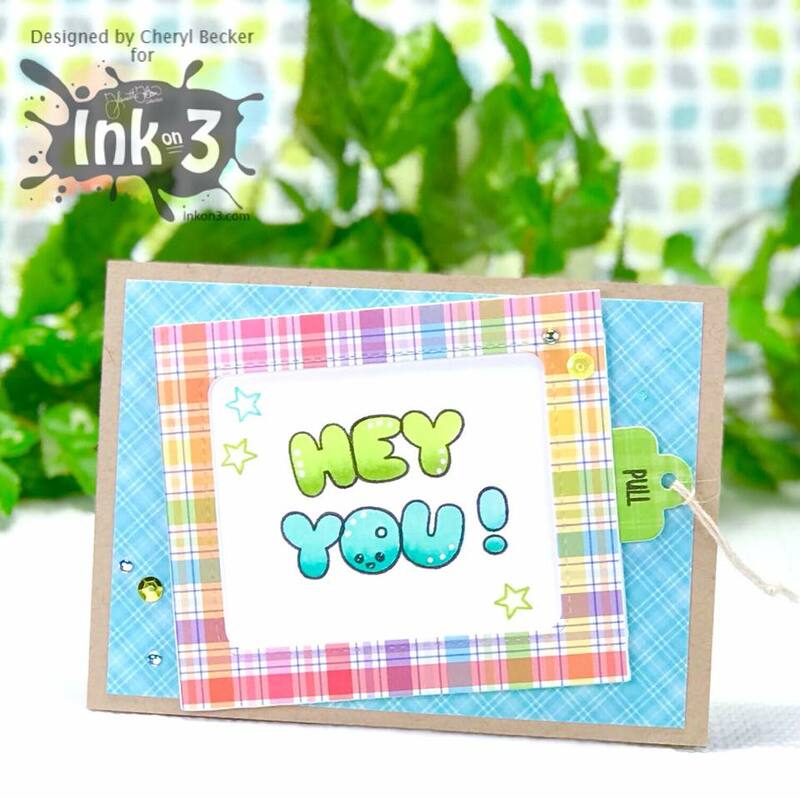 Hey crafters, Cheryl here today, with a super cute slider/window card to share with you. Here's the stamp sets I used. 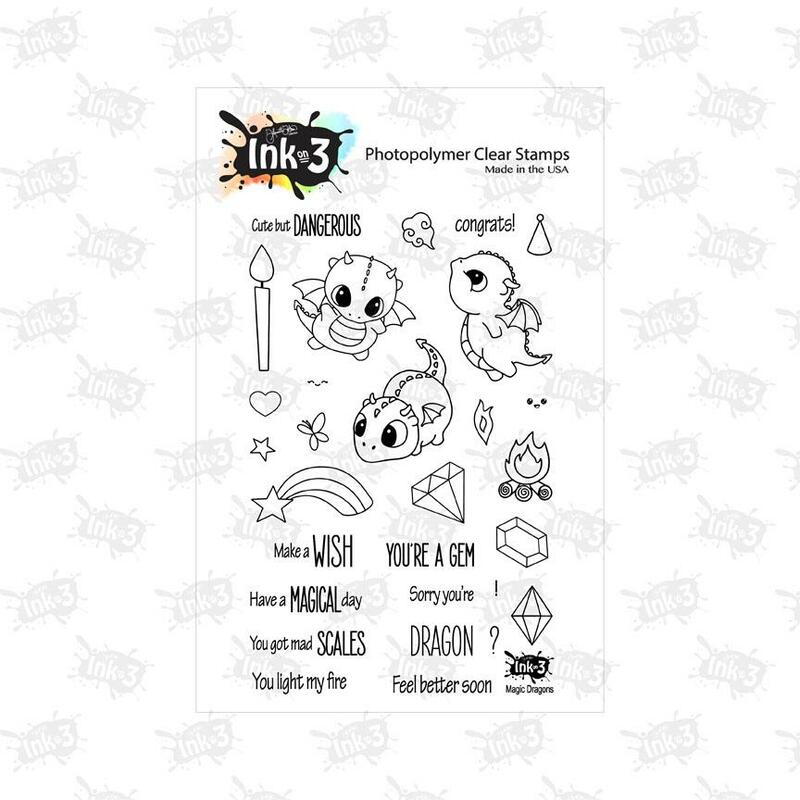 This is probably one of my all time favorite InkOn3 stamp sets! I mean, come on, what's not to love??? Anyway, I stamped out a few of the images and colored with Copic markers. And I didn't even do any shading, simple one marker coloring. 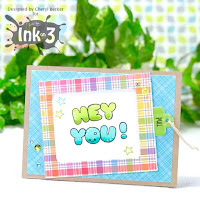 I stamped "Hey You" using the Phat Alphanumeric stamp set using Blackout ink. I colored them in with Copic markers and stamped a few stars. I cut one piece of cardstock just a tad smaller and stamped my inside. The dragon, the flame, and the candle. I also stamped some stars. I again colored these with simple one marker coloring. On the flame and candle I used two. Then I went through my patterned papers and pulled out some to match my color pallet. I picked a blue pattern and adhered it to an A2 card base of Neenah Desert Storm cardstock. I then added the slider to the front of that on an angle. I picked out some gems and sequins and added to the front. DON'T put any in the way of the pull tab slider or it won't open. Ask me how I know, lol. I pulled out my Nuvo glimmer brush and picked a few areas to add shimmer to. It makes things look so pretty! And that's it! It's so fun to make this type of card and fun for the recipient! If you're a paper engineer, you could probably make this slider from scratch. I'm not, and knew I'd use this often so I picked up from Amazon. Glad I did! Ok, take some time for you and sit down to "play" with supplies you have. 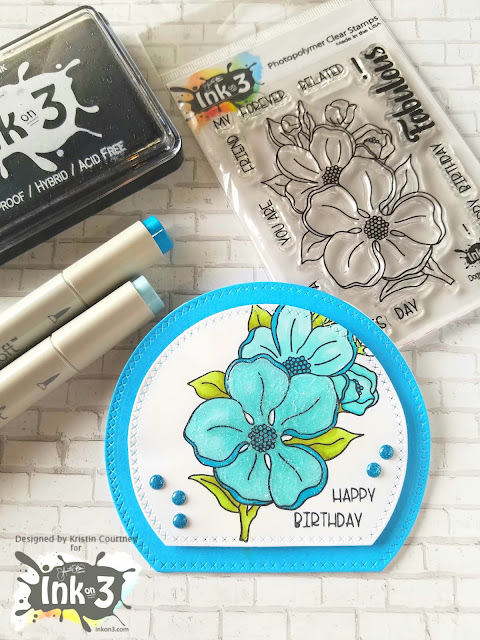 Sharing another fun shaped card using the new Dogwood Flower stamp set from Ink On 3. Ilda here👋, back again today to share with you a couple of cards I made using the same stamps to get different looks! The stamps I'm using today comes from an older Ink On 3 set, Magic Dragons. This set is super cute with lots of fun images, but for today's post I will just be using the gem stones from the set to create some friendship cards. For my first card, I did some ink blending with distress oxide inks to add color to my background panel. I used Bristol paper, stamped the images in with the Juicy Inkpad, then I heat set it with white embossing powder to make the lines pop once colored. To create this cute little shaker window, I used a small heart die and added these beautiful little sparkling crystals. Used the heart die to cut the sentiment banner and lined it up next to the shaker window. For the next card, once again I stamped the gems using the Juicy Ink only this time onto black cardstock and then used gold embossing powder. Then all I did was cut my black cardstock piece into equal sections, then spaced them out onto the card base popping them up with foam tape. Stamped my sentiment with the Blackout Ink and then added glossy accents to each gem. 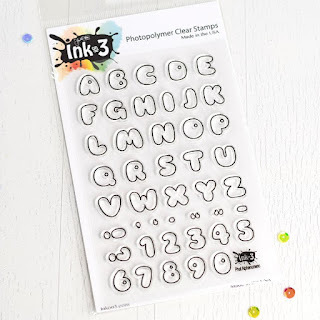 Hi my crafty friends! It's Cheryl, here, with another project using the newest release from InkOn3. And it's such a beautiful image and very fun to color! I used a die from my stash that creates a rosette. I love rosettes! Anyway, I die cut it from kraft cardstock, Neenah Dessert Storm. You need to cut two. I folded on the score lines and adhered the ends together. It's best to use hot glue for this as it needs to be a really strong bond. Here is a video of how to assemble. I stamped out the dogwood image using Juicy embossing ink and heat embossed with white embossing powder. I then die cut the image using the coordinating die and colored with my Mermaid Markers from Jane Davenport. I then stamped out the sentiment onto a banner strip using Juicy and embossed in white. I mounted the image onto the rosette with foam tape. I then positioned my sentiment near the bottom but not to hide too much of the image. I also used foam tape for this. I scattered about some sequins in metallic green and pink. I used liquid glue and held in place a few seconds, as I glued them to the mountain folds of the rosette and I didn't want them tipping. I threaded a bit of twine through the holes at the top. I then took the entire element and glued it to a circle die cut in pink that's a bit bigger than the rosette. It really draws in the pink of the dogwood blooms. As a final bit of bling, I pulled out some chunky glitter I've had for ages!!! I dabbed on tiny dots of my liquid glue to the centers and dropped on tiny bits of the glitter. It really adds such great texture and a bit more sparkle. Not being able to stop myself, lol, I brushed a bit of Nuvo glitter brush over just the petals of the flowers. There, I'm finished with this, for real...lol. 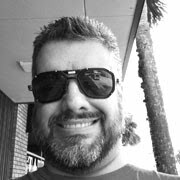 Here's where you can get what I used. Everyone has made some amazing projects for you to enjoy and be inspired by. 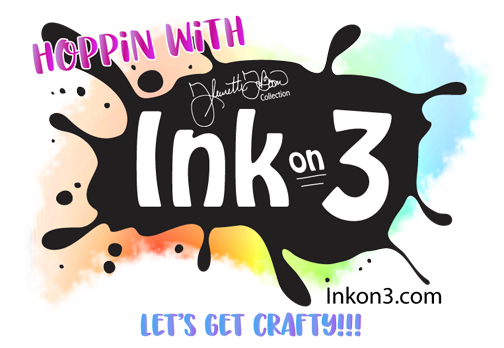 We will be giving away one $25.00 Ink On 3 Shopping Spree! 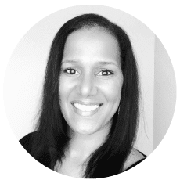 All you have to do to enter, is leave a comment on each stop on the hop and follow each blogger. 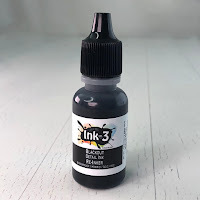 Giveaway will close July 18th at noon CST and winners will be posted on the Ink on 3 blog! Look at all these amazing creatives who made something to share with you! Save 20% this week only on the New Release Dogwood Stamps & dies. Just add the Dogwood stamp set and Dies to your cart. Click link below and you won't even need a coupon. A little backstory on how this stamp set came to life. I was on the phone with my sweet friend Lydia Fielder and we were discussing favorite flowers. Lydia mentioned she loved the Dogwood flower and that she has a tree in her yard. I also love Dogwood flowers and have ever since I saw them for the fist time on a trip I took to Kentucky many years ago. So illustrating this set was such a joy! Thank you Lydia for the inspiration! Blackout Detail Ink. 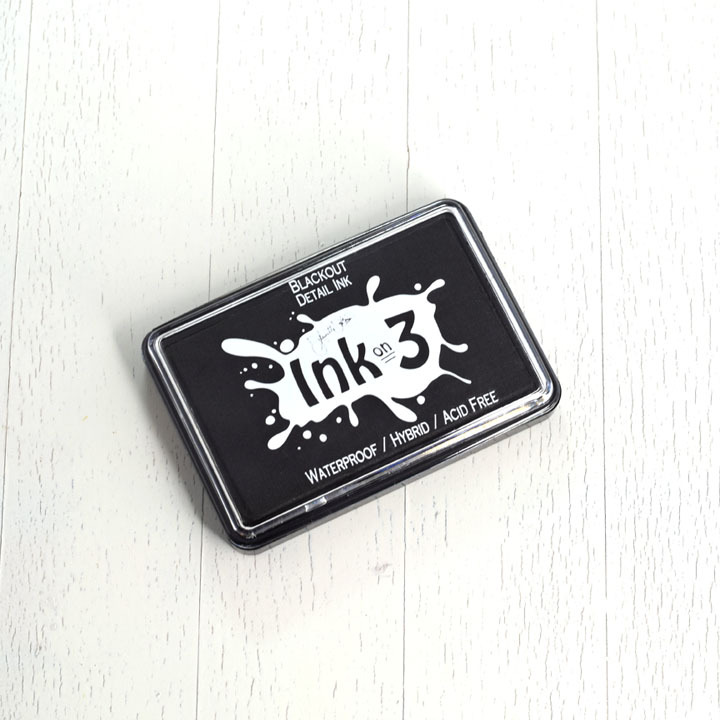 The Blackout Ink gives a rich, crisp black image that is waterproof. 2. Die cut out the Dogwood flowers with the coordinating dies. 3. Watercolor a piece of scrap paper large enough for the stand alone "Hello" word die. 4. 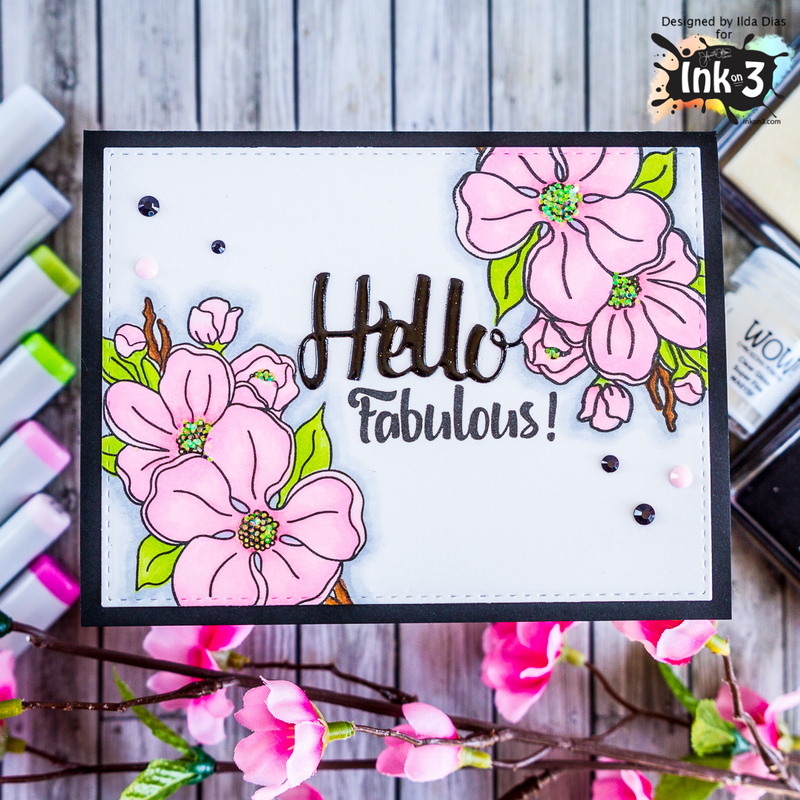 Once your watercolored scrap paper is dry, die cut it out with the "Hello" die and add some Glossy Accents to the top and let that dry. 5. 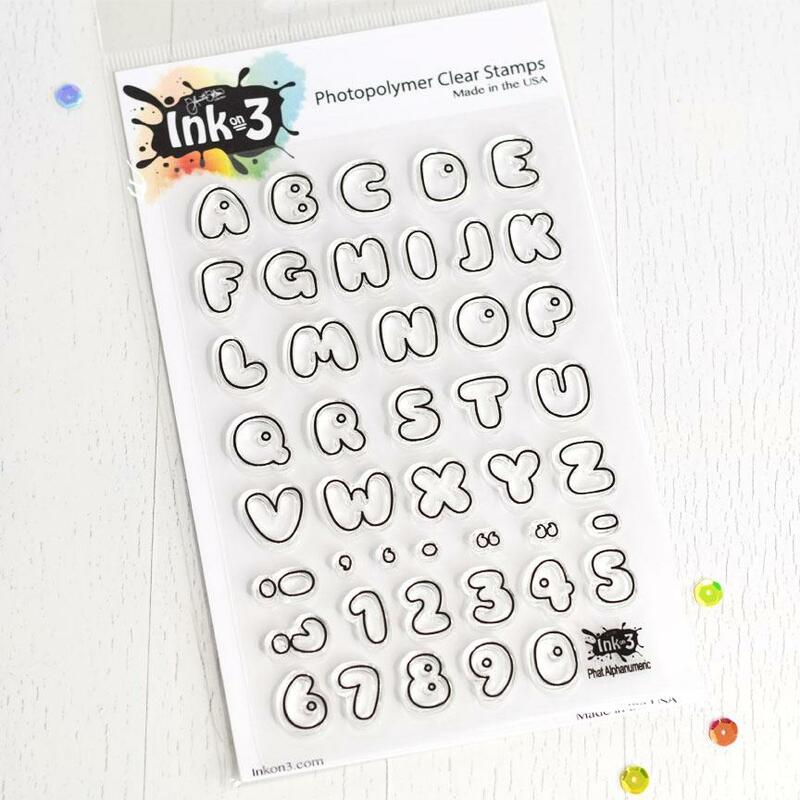 Cut patterned card stock out to 4.25x5.5 (A2) for your card front. 6. Cut another piece of black card stock a little smaller for the front of your card. 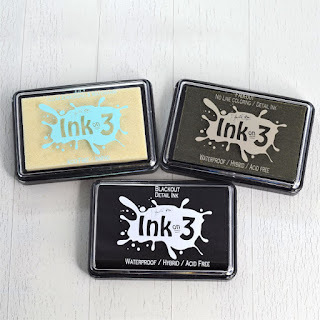 Juicy Embossing Ink, and gold embossing powder and heat set. 8. Tie some twine around the black card stock, then glue to other card front. 9. Glue both card fronts onto an A2 card base. I hope you feel inspired to make one and share it with us! Thanks so much for joining and don't forget to leave a comment & follow each blog on the hop to be entered to win a $25.00 Ink On 3 Shopping Spree! 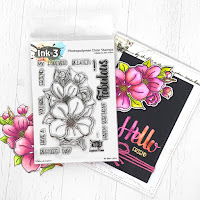 This week Ink on 3 will be releasing another beautiful little floral stamp - the Dogwood Flower Stamp and Die Set. For today's card, I began by stamping out the Dogwood flowers on each corner of my card panel with Blackout ink. I then colored them in with Copic markers and die cut the panel using a stitched rectangle die. Next, I stamped out Fabulous sentiment onto the card front using Blackout ink and Die cut the Hello from black cardstock. To add some shine to the hello I used Juicy ink then covered it with black embossing powder and heat set it. Repeated that a few more times to create a thicker layer. I then finished off the card by adding some crystals to the card front and adding some glitter to the centers. Hope you like my Dogwood Flower creation today. Hey everyone! 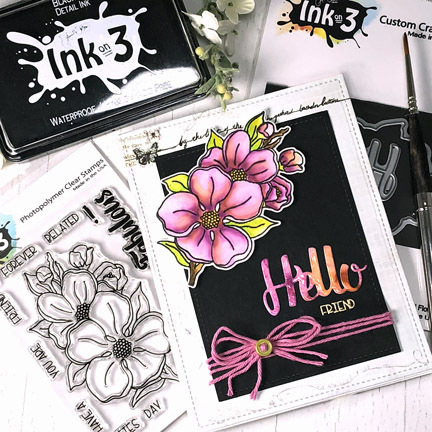 Kelli here sharing a sneak peak of the new stamp set that is going to come out on Saturday! 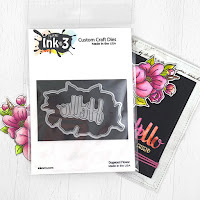 I just love this stamp set and the dies come with this cute scripted "Hello" that I absolutely love! I colored the flowers in R00, R01, R02, R05 for a light pink color. I also went over the biggest blossoms with a Wink of Stella pen to add some shimmer! 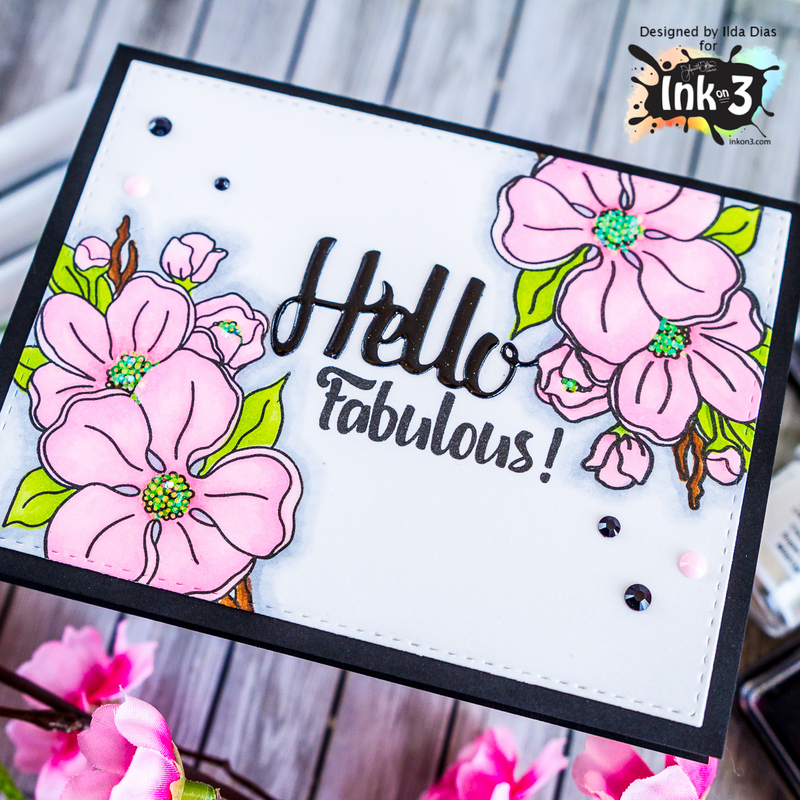 Keep following along because on Saturday we will have a blog hop to introduce the stamp and die set! 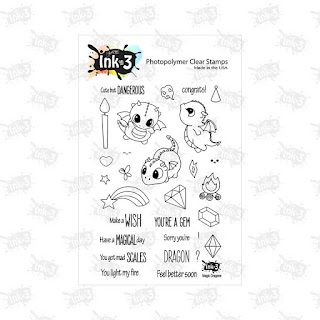 Here is my Ink On 3 design team project card I am posting today. I made this simple card using the stamp set called Roses In Bloom. 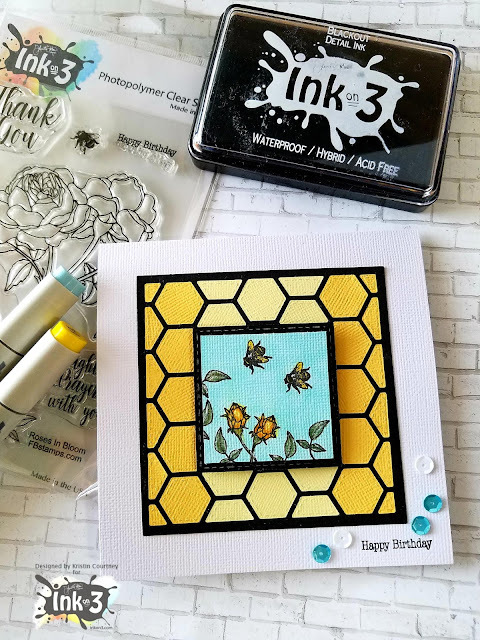 The honeycomb background is just from my stash of mixed dies. 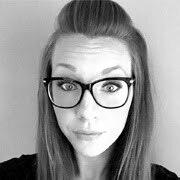 Hello, Ilda here from I love Doing All things crafty and today is Canada Day! Happy Canada Day to all my fellow Canadian Friends! My shaker card today features these cute beavers that come from the Platyrific Pondies Stamp set. Actually, just one of the beavers come in the set and the other I just created by doing some simple mirror stamping. I then die cut the pieces and balloons using the coordinating dies and colored them in with Spectrum Noir Markers. 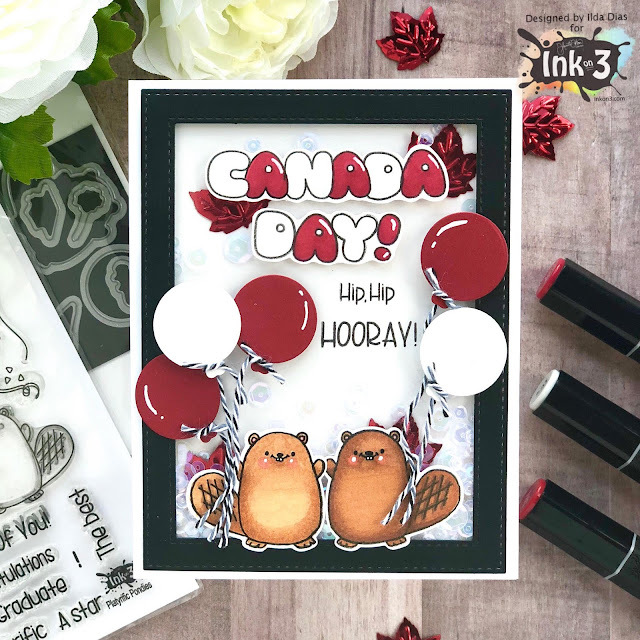 I also used the Phat Alphanumeric set to create the Canada Day sentiment, great set to have when you need to personalize a card.